I'm not sure what the best target assets are for this is, but it's a pretty nice card if you have the right assets. You don't have to be using the asset for the skill check it enhances. It's a weird card. Maybe the talents or composures, like hyperawareness or scientific theory may work best because they have multiple pip types. It's basically an extra skill pip once per turn so long as you have an asset out that has a pip on it of the test you are doing. If you look at it resource for resource, you pay 2 and then can bump a test once per turn. 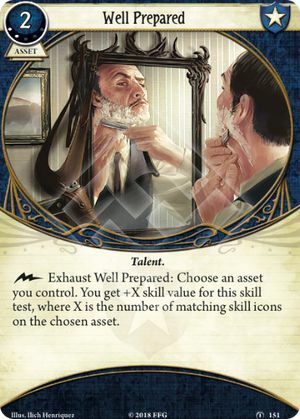 It makes it a bit cheaper than the other original talents overall, but you can only bump once per turn, which is where they outdo this card since they do not have to exhaust. EDIT: I think people prefer physical training lvl 2 as the target because it has 2 fight and 2 will pips. It can also work well when paired with the replacement signature for Carolyn, Foolishness, which has 2 wild pips. That being said, the replacement cards for Carolyn are otherwise pretty much GARBAGE. The signature assets in general are good targets, as each of the new investigators mentioned above include a wild and two other pips. Perhaps that is where Allonym was going. Diana and Joe have signature assets that are Weapons and that can form the cornerstone of a play-style, so both are likely to pack Prepared for the Worst to fetch them out; they have icons worth +2 to Combat+Will (Diana) and Combat+Int (Rex), in each case being the main stats those investigators strive for. Carolyn can really get good use out of Well Prepared, as Ancient Stone (Minds in Harmony), First Aid (3), Physical Training (2) and her signature asset will all let her get +2 to Will with it. Clearly it's fantastic with Foolishness but it's pretty great regardless. In all three of those cases, Well Prepared gives bonuses to key stats that the investigators might otherwise have issues getting consistent bonuses to - Combat for Diana and Joe, and Will for Carolyn. Incidentally, Foolishness is fine, and if you're leaning into using him you can get him out with Calling in Favours to again make him more accessible and therefore usable with Well Prepared. To Fight The Black Wind is a nasty weakness for sure, but two of the cards in the upcoming cycle (Mr "Rook" and Deny Existence) make it a lot less of a problem, plus Alyssa Graham is an obvious counter. I don't feel that Foolishness is on par with other signatures, and it also requires additional work to make useful after you spend actions playing it and it takes a valuable ally slot. Carolyn has a very lackluster skill line, so I can see the appeal of Foolishness in that regard, but I still don't find it worth using, especially when it is paired with To Fight the Black Wind. That card has lost me a campaign before. I don't enjoy using my cards to heal foolishness when I brought them to heal allies, and I prefer even less to weight my deck against a nasty weakness because it forces deck building to play counters to cards you have to take. I prefer to play against the scenario rather than split my attention as I also try to prepare to play against my own deck. Most other investigators can get away with letting a weakness slide if they have to due to circumstances of the scenario, but you really cannot afford that with To Fight the Black Wind. Needless to say, I'm happy to see hypnotherapy and rational thought. I am still not quite sure why Carolyn has such a low statline (the deck building versatility I guess?). Foolishness isn't the strongest Signature but isn't the weakest either. Put simply, I've found that Carolyn is kind of a "carry", in that she is pretty weak early on in a campaign but pretty strong later on - this is similar to Rogues, and in contrast to most Seekers and Guardians, who generally start out very effective with good tools for their main job, and gain incremental increases in power with exp. With Foolishness, this means that early on the card is completely useless, only there to act as an emergency trigger for Calling in Favours if you don't have any other allies in hand, or to commit to a skill test as a copy of Unexpected Courage (making it one of the worst Signatures in the game). First time I played Carolyn I tried healing Foolishness using First Aid, only to realise too late how many resources and how much time I had wasted. After the first couple of scenarios I purchased Well Prepared, and then Foolishness was there purely to make Well Prepared work. Then after another couple of scenarios I got Moment of Respite, which was perfect for Foolishness. From now on, I'm going to shoot for a big number with identifying Ancient Stone early on - with a decent number of charges it won't really be a waste to use it to heal Foolishness, and will actually be welcome in some circumstances as a pool of horror I can heal when I don't need to heal anything else, so I can keep the resources rolling in. I definitely agree that playing around weaknesses is generally a losing proposition, but with Carolyn you can use tools to mitigate the weakness without dividing your attention - Unlike most Mystics, the Intellect boost from Alyssa Graham gives you a direct boost towards your main job, and using her is a free triggered ability, so it doesn't impact your playstyle overmuch. Mr "Rook" will let you try to find To Fight The Black Wind at an opportune moment, but he will also let you tutor out a key card when doing so, so again you're seeing the benefit alongside mitigating the weakness. I expect Deny Existence will be a staple card for almost anyone who can use it, and while it'll be a shame to use it for cancelling the horror from To Fight The Black Wind instead of something else, it still has all its other applications as well (particularly once the threat of the weakness has passed). Deckbuilding versatility is definitely the reason for her statline (for instance, Akachi, Mark and Rita all have an extra stat point but have restrictive deckbuilding, and the Dunwich investigators get an extra health/sanity point over investigators with 5/2 class access), but I don't think it's justified, as her deckbuilding is weird but not exactly overpowered. Were they worried that if she got 4 base willpower she was going to dominate the game with her lack of access to any upgraded attack spells? Even a point of Agility would have been fine. She gets the extra health/sanity to compensate, I guess, which is why I like leaning into using her in a defensive "tank" role. Is Well Prepared really that good? A once per turn +2 to a check, if you have the right card sounds nice, but not really overwhelming to me. All the skill boosters from that cycle (well prepared, high roller, recall the future, quick study, and cornered) are that good, they are marginal in expert, and I guess on Easy they are sometimes not required, but in general they are all very strong, as they play to the factions key strength and can overwhelmingly boost a single stat whether it is the main one for a key check or an off one to prevent a nasty treachery card. If you don't think they are that good try using them. I will forever use them, until a better one comes along as they allowed solo skids to complete MM and get all 6 cultists with time to spare. You know the card "Unexpected courage"? It's that, every turn, forever. That may seem like a glib response, and it is, but the longer answer is that it's a great card. Zoey, for instance, can use it to target her cross and get +3 to hit, which counteracts the weakness of using Machete/Timeworn Brand (a playstyle she's well-suited to both thematically and mechanically), namely the relative lack of accuracy. Leo Anderson's unique ally has 2 wild icons so for him it's a bonus to anything. If you're using a shotgun you want whatever bonuses you can get since it translates into damage - and Well Prepared gives you +2. Same with a BAR, you don't need to worry about accuracy if you're not using that much ammo for a shot because you can make it up with Well Prepared. If you're in a larger group such that you can afford to basically just be doing monster-hunting, and if you're using a Lightning Gun, feel free to ignore Well Prepared. Now, the benefits of +2 to a test depend on your skill value, the difficulty and the chaos bag, for sure, but repeatable bonuses to tests are inherently great, since no matter what you're doing and no matter who you're playing, you will be taking quite a few tests, even if you're using cards to minimise the number you need to take. It's particularly great for all 3 The Circle Undone investigators who have access to it, because they have difficulty finding boosts elsewhere: Carolyn probably wants to be using spells to help out in dealing with enemies, but she can't buy upgraded Shrivelling or Mists of R'lyeh, so Well Prepared fills that gap. If you are using Foolishness with her, it lets her do anything with a degree of reliability - I pulled off a clutch evade for 7 at one point, and without it I'd have been hosed. With Guardian secondary and base 3 combat, Diana Stanley can lean into using weapons as well as spells, meaning she isn't shackled to using Shrivelling all day every day like most mystics, but to do so she'll need bonuses to accuracy. By the same token, her variable Willpower means that she'll sometimes need boosts to succeed. If she happens to have Agility or Intellect icons in play she can get boosts to those as well, making the most of her balanced statline, and even a +1 to a test can make a big difference. With Guardian secondary and base 4 combat, and a unique asset that rewards him for killing enemies, and access to all the Guardian cards that let you get bonuses for being engaged with or defeating enemies, Joe Diamond really needs to be fighting things, but he also needs accuracy bonuses because he doesn't have access to the higher-level Guardian cards. Having said that, you can't just throw it into a deck and hope, you need to be ensuring that you have cards with good icons in play. For this reason, I don't recommend it for Mark Harrigan, as he doesn't have a signature asset with icons and he already has on-demand bonuses to skill tests. Roland Banks might be better off with Quick Study (a card that's otherwise not worth including for anyone). Yep, Recall the Future is great. Particularly on higher difficulties (or even just Normal on TFA) where it's relatively straightforward to achieve a decent bonus but you'd have to invest a lot more into the check to cover just one or two much higher tokens - in a theoretical situation where the chaos bag is -3 or better, except for a single -5, you can get up to +3, call "-5" and then you've halved your chances of failure without needing to use up any resources (unless it actually is -5, at which point you passed so what are you complaining about?). It's better when you have a wider distribution of chaos tokens to worry about (reducing the need to overinvest to cover a single outlier), or where you have lots of copies of the same token that gives you trouble (e.g. Carcosa on Hard, there's 3 skulls in the bag, so if you call "Skull" that's 3 more tokens you're passing on). I recently used it a lot with Sefina as well, it was great for ensuring that I could hit +2 thresholds, overall saved me a load of resources that would have been spent on one-time boosts. You can also use it the other way around, if you have a check you're not likely to pass (e.g. Agility 3 test and you're Agility 2), you can call 0 or -1 and still be in with a chance, but if you fail you haven't lost anything (whereas Unexpected Courage would). And the fact that you don't lose anything unless it triggers is what makes it good, since it means that you can use all those applications until such a time as it's made you pass a test. Even if it never triggers it's valuable because it reduces the pressure to overcommit to vital tests. It can be frustrating to commit up to +4 on a test only to draw the -6, and it can be equally frustrating to commit up to +6 only to draw a 0; Recall the Future flattens the curve of bonuses you need. Overall I see it as roughly being equivalent to +1 to all tests until it triggers, except for the above situation where you're covering for a single token that would need +2 to cover. The reason for this is that every bonus to your skill value essentially makes one type of token that would have been a failure into a success. This is not quite true for situations where the Symbol tokens are the same as one of the Number tokens, e.g. if an extra +1 means that both Skull and -2 are now passing, and it gets more complicated with tests where the amount you succeed or fail by matters, but it seems like a handy rule of thumb. If you have 2 copies in play you get even more benefit. Plus of course it synergises well with anything like Dark Prophecy or Grotesque Statue that increases the chance of getting a specific token, and works hand-in-glove with Premonition. 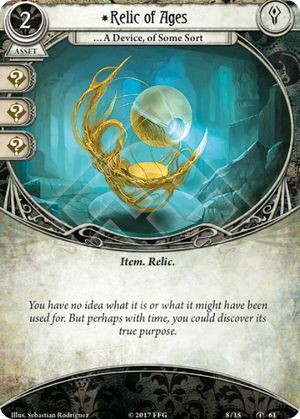 If you are using Recall the Future I recommend keeping a record of all the tokens currently in the bag (if you're using an app for the chaos bag you can probably see the distribution there). Finally, I love that they made 5 very similar cards (assets that give limited bonuses to tests) and yet managed to make them all distinct and in sync with the flavour of the class. Wait, how is the +2 not conditional on having revealed the named token? The post-then part only resolves if the pre-then part is successfully resolved in full. If you don't reveal the named token, it doesn't do anything, which means it doesn't successfully resolve in full. The real question shouldn't be "Is it good?" (for 12 xp it had better be decent!) but "Is it better than my other options that cost 12 xp?" I love Well Prepared, but it's not exactly the Key of Ys! Now that all of the investigators have been announced. 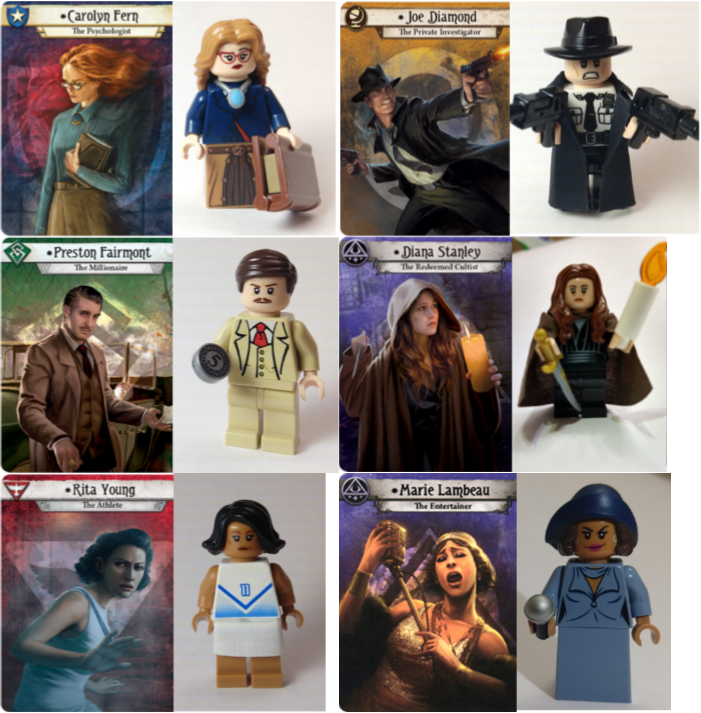 Here's all of The Circle Undone in Lego form! Holy crap. All this time, I've assumed it only worked on the symbol tokens. Wow, that's amazing. It was always good, but I mean it's amazing. Quick Study seems pretty weak to me. Unless you are Rex. Its a rather terrible seeker card in general. You arent generally taking many tests that do not have to do with getting clues and taking Quick study for just those 1-2/map unique scenario skill tests is a bad idea. The real place where this card shines is Roland, Drop a clue to benefit an attack, kill the enemy, regain the clue immediately, absolutely bonkers efficiency. Except that seekers already have like what 15 ways to get additional clues per investigate, probably more, and a rather large number of really good cards that trigger on having a clue on a location (see Preposterous sketches and inquiring mind, just off the top of my head). It is often overlooked and very useful, is it as powerful as the others maybe not, is it still a good card? IMO absolutely. Yeah plus Roland can give his signature gun a +6 with it and repick it up for free. Or if you are hit with any encounter cards that will take more than a single action to recover from if you fail. the . The +3 makes evading an enemy really easy. All of that for the cost of having to do one more investigate check. Its not a use ever turn type of card but it is a constant cost analysis against whether passing the particular test is worth having to perform another investigate action. ^ and this will likely fluctuate depending on the shroud of the location you are on regardless of if you are Roland or not.